This article lists those emergency workers listed above who died while fulfilling their duties at the World Trade Center on September 11, 2001. 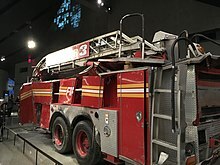 FDNY Truck at the collapsed World Trade Center on September 11, 2001. 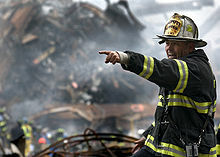 A deputy chief coordinates recovery efforts three days after the collapse of the World Trade Center. There were 75 firehouses in which at least one member was killed. The FDNY also lost its department chief, first deputy commissioner, one of its marshals, one of its chaplains, as well as other administrative or specialty personnel. Operationally and geographically, the department is nominally organized into five borough commands for the five traditional boroughs of New York. Within those borough commands exist nine divisions, each headed by a deputy chief. Within each division operate four to seven battalions, led by a battalion chief and typically consisting of 180–200 firefighters and officers. Each battalion consists of four to eight companies, with a company being led by a captain. He commands three lieutenants and 16–42 firefighters. Last is the unit consisting of the members of the company on call during a given tour, consisting of a lieutenant or a captain plus a number of firefighters depending on the type of unit: three to four on an engine company, five on a ladder company (also known as a truck company), five for a rescue company, five for a squad company, four in a marine company, and six for the hazardous materials company. On September 11, the battalion chief of Battalion 1 witnessed American Airlines Flight 11 crash into the North Tower of the World Trade Center and immediately radioed a multiple alarm incident. Over the course of the next three hours, 121 engine companies, 62 ladder companies and 27 fire officers were deployed to the scene. All off-duty firefighters were recalled — the first time the FDNY had issued a total recall in over 30 years. In addition to the regular fire apparatus and personnel assigned to the incident, the FDNY also deployed its only Haz-Mat unit, its mobile command center, its field communications unit, all its five rescue units, both of its high-rise units, six of its seven squad units, and one of its two tactical support units. 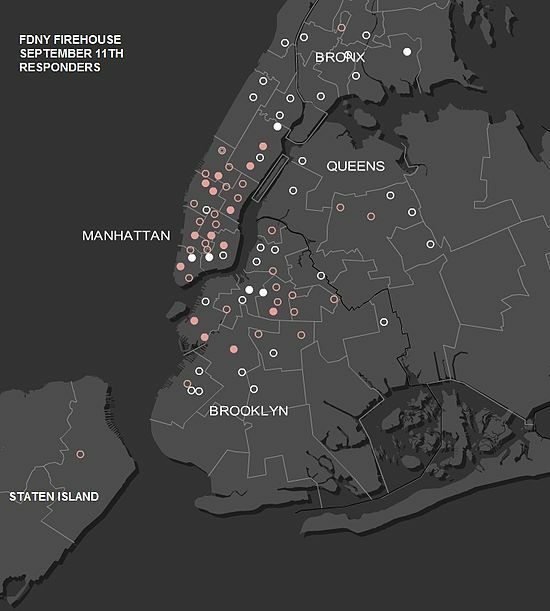 Map of FDNY's first-responding firehouses to the September 11 attacks. Circles show the location of the company responding; solid circles mean multiple companies. Rose-colored circles indicate companies with casualties. The following list provides further details to the preceding list by categorizing the FDNY company with the rank, name, and age (if available) of each casualty. Names without ranks typically denote the rank of firefighter. Rescue workers at the World Trade Center on September 14, 2001. Within minutes of Flight 11's impact, the Port Authority of New York and New Jersey Police Department (PAPD) began deploying officers from the Port Authority Trans-Hudson, bridges, tunnels, and airport commands. The PAPD commanding officer on the scene ordered a full evacuation of the North Tower at 9 a.m., about three minutes before Flight 175 hit the South Tower. At the same time, the PAPD's two most senior officers, superintendent Ferdinand Morrone and Chief James Romito, both arrived separately at the World Trade Center. Temporary NYPD headquarters at 106 Liberty St; set up near the World Trade Center on September 11, 2001. 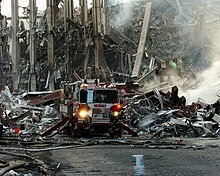 Several New York City Police Department (NYPD) officers saw Flight 11's impact with the North Tower and immediately reported it to dispatchers. 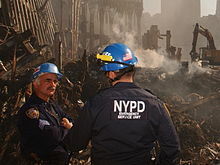 Ten minutes after Flight 11's impact and seven minutes before Flight 175's impact, the NYPD chief of department was en route to the scene and raised the police mobilization to level 4, thereby sending around 22 lieutenants, 100 sergeants, and 800 police officers to the World Trade Center. NYPD personnel were primarily responsible for assisting in evacuations and helping injured civilians. Two NYPD officers at the World Trade Center site five weeks after the attacks. Three police helicopters were also deployed to report on conditions and assess the feasibility of a rooftop landing or of special rescue operations. Once Flight 175 had struck the South Tower, another level 4 mobilization was ordered, bringing to almost 2,000 the number of NYPD personnel at the scene. Some were ordered to enter the World Trade Center to assist with the FDNY's evacuations. Moira Ann Smith, 38 – posthumously named Glamour magazine's "Woman of the Year"
^ "Police back on day-to-day beat after 9/11 nightmare". CNN. July 21, 2002. Archived from the original on 2008-05-17. Retrieved 2011-09-02. ^ "Post-9/11 report recommends police, fire response changes". USA Today. Associated Press. August 19, 2002. Archived from the original on 2011-08-20. Retrieved 2011-09-02. ^ a b "WORLD MEMORIAL Medic Tribute". Archived from the original on 2017-02-03. Retrieved 2015-08-18. ^ a b Chang, Dean (29 December 2001). "Father's Wait Ends; Fire Patrol vet pulls son's remains from WTC". New York Daily News. Archived from the original on 2018-05-18. Retrieved 26 July 2017. ^ "FDNY Fire Operations response on September 11" (PDF). nyc.gov. Archived (PDF) from the original on 2011-05-24. Retrieved July 19, 2013. ^ "Exhibit 10: Deployment of Fire Special Operations Units" (PDF). nyc.gov. Archived (PDF) from the original on 2012-10-23. Retrieved July 19, 2013. ^ "Remembering Ferdinand "Fred" Morrone – 9/11/2001". The Grouchy Gamer. Archived from the original on 2011-09-21. Retrieved 2011-09-11. ^ "Remembering September 11, 2001: James A. Romito Obituary". Legacy.com. Archived from the original on 2012-10-21. Retrieved 2011-09-11. ^ "Press Release Article – Port Authority of NY & NJ". Panynj.gov. Archived from the original on 2011-11-09. Retrieved 2011-09-11. ^ "9/11 Victims – Police & Port Authority". Afge171.org. Archived from the original on 2012-04-02. Retrieved 2011-09-11. ^ "9/11 hero's husband returns award given to late wife after Caitlyn Jenner gets same award". Chicago Tribune. Retrieved 2015-11-17. ^ "September 11, 2001". Nypdangels.com. Retrieved 2012-07-03. Fireboat John H. Glenn Jr.